The 2018 Mustang will be the fastest pony car ever, Ford said, thanks to an optional "drag strip" mode. Ford Motor Co. is offering a variety of upgrades to the freshened 2018 Mustang, but some of them won’t be available in Canada until the 2019 model rolls out. Ford Canada says it will offer the Mustang GT Performance Pack Level 2 package on sports car beginning on 2019 models. It’s immediately available in the United States. The 2018 model will arrive at Canadian dealerships this month and starts at $30,638, shipping included. The updated Mustang already includes a variety of upgrades that add power, improve handling and boost profit margins. But Ford Motor Co. said from Detroit on Monday the Mustang GT Performance Pack Level 2 package will include wider tires, special wheels, unique stability control and Brembo brake calipres. 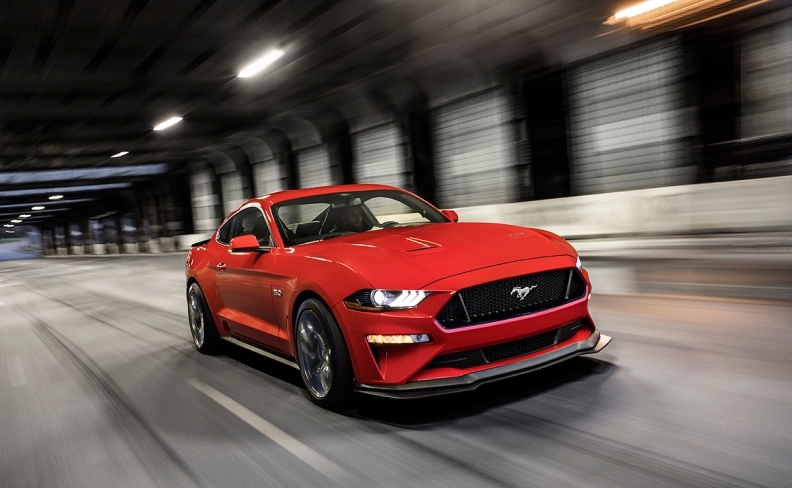 The new option will cost US$6,500 — Canadian pricing for the 2019 model hasn’t been announced — and offer customers an option between Power Pack Level 1 and the automaker's track-capable GT350. "It will just beg you to go faster," Jamie Cullen, Ford's supervisor for vehicle dynamics development, said in a statement. "The car has lightning-quick response and never gives up grip." The Level 2 package, only available with a manual transmission, puts the car a half-inch closer to the ground than the Level 1 pack. It also includes a 67 per cent stiffer rear stabilizer bar, a 12 per cent stiffer front stabilizer bar, 20 per cent stiffer front springs and 12 per cent stiffer rear springs. The pack comes with black detailing on the splitter and spoiler, the tire spat on the back edge of the rear wheel wells and the 10-spoke wheels. The 2018 Mustang will be the fastest pony car ever, Ford said, thanks to an optional "drag strip" mode. It will also come with an optional "good neighbour" mode that quiets the noise emitted from the car's exhaust pipes. Ford is dropping the Mustang's 3.7-litre V-6 engine, which executives have said accounts for about 15 per cent of sales. Michael Martinez of Automotive News and Greg Layson of Automotive News Canada contributed to this report.